Ultimately the aim of any website is to be a space that users come back to time and time again and recommend to others. In order to create this dream scenario, a website needs to fulfil the goals and needs of the user. The foremost need of the user is to be able to access and easily use the website in order to get what they need from it quickly and efficiently. The usability of a website is an integral part of its success. To ensure that your web design is as usable as possible, it’s important to test the website regularly through its creation. Such testing is often overlooked by many designers, developers and businesses, who will instead rely on their own intuition in working out whether their site has high usability. However, the success of your site is crucially based on what your actual users think and feel. Their feedback will help to reveal any potential issues with your design as well as offer you insightful and valuable information on how they are interacting with your site so you can tweak your designs for higher usability. There are many quick and easy tools and services in existence that can help you to test the usability of your web designs, with options for all budgets, it’s just about choosing the right one to suit your needs. 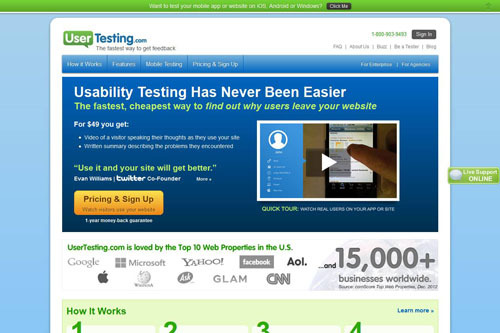 Outlined here are ten of the top usability testing services available for you to use. Within 48 hours or less of posting your design on the Concept Feedback site, you’ll receive an objective third-party analysis of your website from experienced design, usability and strategy professionals. This website also offers step-by-step advice to increase conversation rates and generate more revenue from your website as well as custom consulting packages. Costs for the feedback service are priced at $99 per expert. 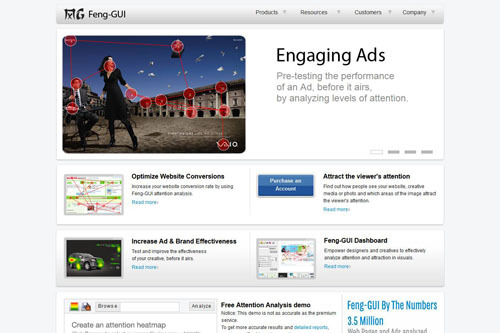 Instead of using real users to test your site, Feng-Gui simulates human vision and creates heat maps based on an algorithm that predicts what a real human would be most likely to look at. This service allows you to effectively measure the visual effectiveness of an image or video, allowing you to effectively balance the use of images and text with the navigation of your website. Using a pay-as-you-go system, you can have 10 images analysed for only $25. 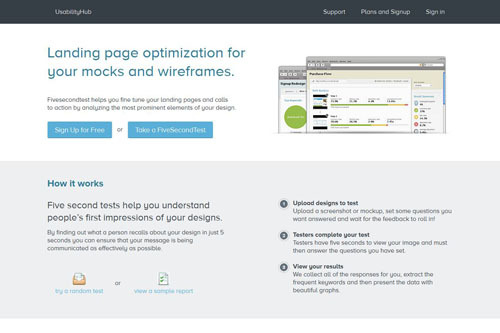 FiveSecondTest allows you to understand people’s first impressions of your designs. Simply upload a screenshot or mock-up of your site and set some questions for users to feedback on. Users will then have 5 seconds to view your image before they answer the questions you have set. Their answers will help you to identify whether or not your brand message is prominent enough, if your call to action is working and what users immediately like and dislike about your design. The free community plan lets you earn tests by participating in tests run by others and paid plans start at $20 per month for advanced services. From as little as $33 and within an hour of posting your design, UserTesting.com provides you with usability testing videos of real users speaking their thoughts as they use your website. You also get a written summary of the experience of the user, detailing any problems they encountered while on the website, as well as their answers to your set questions. 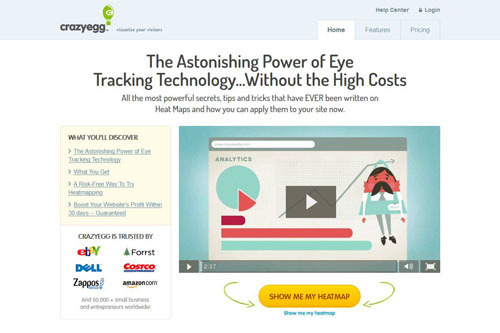 Using eye-tracking technology, CrazyEgg shows you exactly how users are interacting with your website. The service provides you with heat maps of where people clicked on your site, a scroll map showing how far down the page people are scrolling, and confetti, which allows you to distinguish between all of the clicks your website gets, broken down by referral source, search term and other variables. All plans are free for 30 days and then the basic plan is only $9 a month and includes 10,000 visits per month, up to 10 active pages, and daily reporting. 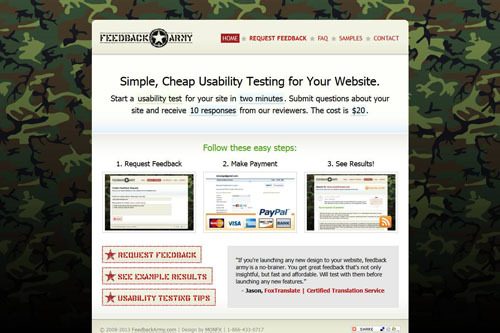 For just $20, Feedback Army allows you to share your URL with reviewers who then make comments or answer set questions about the design. At this starting price you can receive fast feedback from 10 reviewers. The reviewers on Feedback Army come from Mechanical Turk. 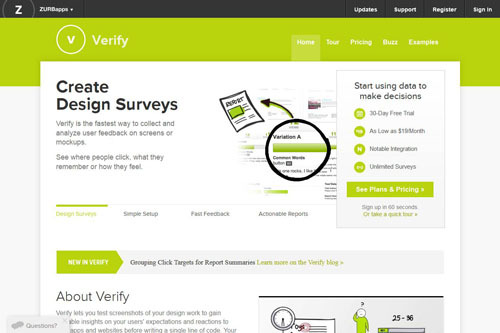 Verify is a fast way to test screenshots of your web designs to gain valuable insight into user expectations and reactions. Including nine different test types: click, memory, mood, preference, annotate, label, multi-page click, and linked, user tests can be set up in less than three minutes. A 30-day free trail is available on all accounts. The “Plus” plan is $9 per month and includes unlimited tests, and the “Premium” plan includes demographics reports, linked tests and PDF export. 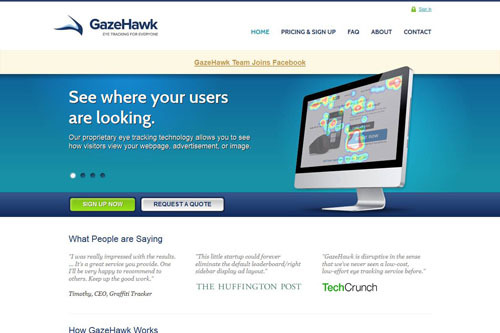 Using eye-tracking technology, GazeHawk allows you to see how visitors view your designs. 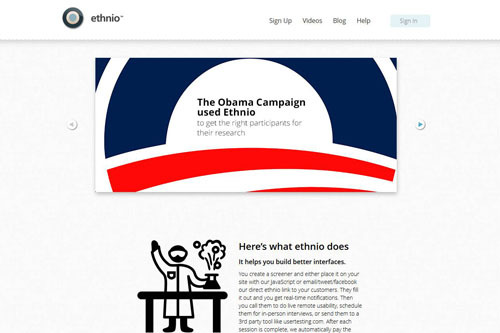 Depending on your needs and preferences the site offers targeted or general user studies. A 10-participant study with heat maps and gaze replays starts at $495. 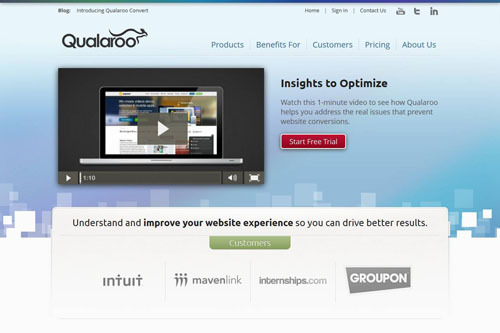 Using a small piece of code, Qualaroo allows you to interact with users to your website as they are navigating your site. The service allows you to target the right question at exactly the moment that you are likely to uncover a critical insight, based on the user behaviour as they use your site. You can get insight into your visitors, influence their behaviour and by doing so, hopefully turn them into valuable customers. This service starts at $79 per month. From the use of eye-tracking technology to generate heat maps of the behaviour of your potential users, to expert advice and feedback to real-time insights from your target audience, there are a host of usability testing services available. Whatever your budget, there will be a package to suit your needs, so don’t rely on your own reactions and experiences to your designs. 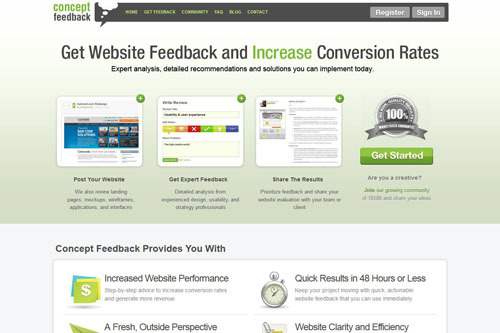 Feedback from your potential customers on the usability of your website is a vital contribution to its success. Aamir Jiwa has written 1 post on web design mash. Aamir writes for an ink and toner experts Clickinks.com. During the day he is an online marketer, in his spare time he learning photography.